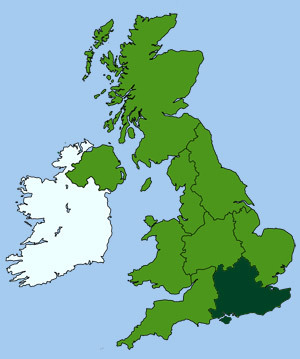 Stretching for several miles along the River Wye, High Wycombe is one of the largest towns in Buckinghamshire. An important commercial centre since since Roman times, it became a thriving wool and lace town during the middle ages. Since the 18th century is has been better know for furniture manufacture, particularly Windsor Chairs. An industry based on the local beech trees that proliferate in the surrounding Chiltern Hills. 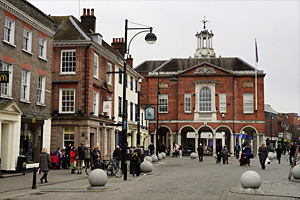 Of the several fine buildings in the Georgian High Street are the Guildhall (1757) and octagonal Market House (1604). Both scheduled Ancient Monuments. The Guildhall (shown here) is raised on stone arches with a cupola above. The octagonal Market House (or Shambles) is topped by a lantern designed by Robert Adam in 1761. Weekly markets are held beneath. The town has several other old buildings of interest, including the Elizabethan almshouses in Bowerdean Road and Easton Street. The grand red brick and stone Town Hall (1904) is of late Renaissance style. Modern architecture in the town includes the new College of Technology and the General Hospital. Two old coaching inns once stood in the High Street, the White Lion and the Red Lion. It was from the balcony of the Red Lion that Benjamin Disraeli made his first political speech. Later becoming Prime Minister, Disraeli lived at nearby Hughenden Manor from 1848 until his death in 1881. The medieval parish church (All Saints), is the largest in the county. It supports a 100ft tower with a peal of 14 bells. Within, it has fine woodwork screens and stalls. A large stained-glass window was a gift of Dame Francis Dove in memory of 17 famous women. The ruins of the Hospital of St.John the Baptist (located at the end of Easton Street), date back to 1180. The hospital ran up until 1550, when it became a school. The school operated up until 1883, when it finally moved to a new building and the old buildings were demolished. The remains of a 2nd-c Roman villa were unearthed just east of All Saints Church. Several prehistoric structures and ancient earthworks can also be found on the nearby hills, indicating a long history of settlement in this area. The town is located in the heart of the Chiltern Hills and is an ideal base from which to explore this beautiful area of countryside. The Grade II listed Castle Hill House (17th-c), set in the grounds of a medieval motte-and-bailey, houses an extensive collection of domestic chairs and chair making equipment, telling the story of the local furniture industry and other trades. Chair and furniture designs from the reign of James I to Queen Anne are exhibited, including examples of Chippendale, Hepplewhite, Sheraton and Windsor. The charming estate of West Wycombe lies a little further west, along the A40. The estate contains a National Trust owned village and the ancestral home of the Dashwood family, who still live at the main house. The village is a genuine homestead, lived in by local workers. The main street is lined with 15th to 18th century half-timbered and brick buildings, which have been authentically maintained. Next to the village is Wycombe Park, a great house built in the 18th-c to a Humphry Repton design. It has an excellent collection of old masterpieces, tapestries and period furniture. The surrounding grounds and landscaped parkland contain an artificial lake shaped like a swan and several classical temples. On the hill, opposite the park, sits St Lawrence's Church. An unusual ecclesiastical building, remodeled by Sir Francis Dashwood with great Corinthian columns, painted ceilings, and fine ironwork and wood carvings. A large golden ball sits on the top, reputed to be a venue for the infamous Hellfire Club. Wycombe Park was the home of Sir Francis Dashwood from 1708 to 1781, who founded the Hell-Fire Club. Members are said to have held wild parties in caves hewn out of the nearby hillside, with mock Gothic ruin entrance. The house and grounds are open to the public (National Trust).